I just checked the NGC Census (more accurately described as the population report) and an MS-63 has been graded relatively recently. I say "relatively" as I don't check it as often as I did in the past but it couldn't have been more than a month or two ago. This is the first 1931 circulation strike recorded in either population report, the other one being PCGS. I don't have access to SANGS. Someone provided the link once before but it didn't work for me. In any event, it is a coin I have mentioned many times and form my point of view, the #1 coin in the Union series though most presumably assign this distinction to the 1931 tickey. I just heard this wonderful news earlier today from a prominent Cape Town collector and was preparing a post on this issue. When I opened the forum page I saw that you have already made the announcement! A few years ago I did a long post on the 1931 silver issues - if one scrolls down one should find it somewhere on the forgotten pages below. I just has a look at the latest pop report and saw that in terms of the 3d, nothing (no coins) was added in the mean time. Regarding the 6d, 3 coins were added of which two are actually MS coins (a MS61 and a MS63). Regarding the shillings, 3 were added, the highest being a VF. Regarding the 2-Shilling, nothing was recorded before but now the MS63 was registered as the first ever in the NGC population report. Lastly, regarding the Half Crown, one coin (VF) was added. So looking at both the numerical and detail graded numbers , I must agree with you that the 1931 Two-Shilling is the number 1 coin in the Union series and probably in all the different SA coinage series. 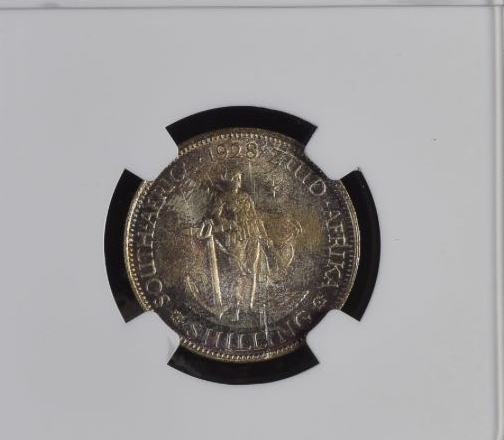 Lastly, about 5 or 6 years ago, I posted a picture of a 1931 Two-shilling that belongs to a collecting friend of mine who turns 80 next month. He does not own a computer and knows nothing about the internet or grading companies. So there are still some jewels out there that should come on the market as the years progress and the last of the "old time" collectors fade away. But I truly think that bar an exception here or there, the "best" coins are already graded and the ones still kept "raw" in private collections are few and far between. 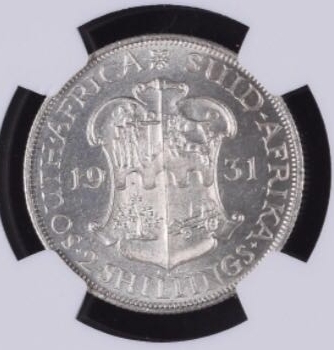 ISo looking at both the numerical and detail graded numbers , I must agree with you that the 1931 Two-Shilling is the number 1 coin in the Union series and probably in all the different SA coinage series. 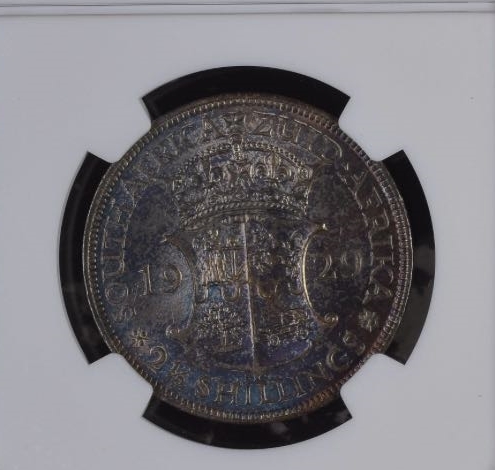 The prominent coin in the entire South African series is always going to be the 1898 "Single 9" pond. Or if it isn't, the gold 2/6 pattern. In terms of value, the record in a public sale is the 1928 pattern sovereign sold by Heritage for $184,000.. However, DNZ (or Baldwins) sold two other Sovereign patters (don't remember the metal) for much less. they weren't graded and sold in a much weaker market but I consider the Heritage sale an outlier because I don't believe that price will repeat because it isn't a gold coin. Heritage also sold the 1928 SP-63 6D for $155,000. I don't believe it is as significant as an MS 3D, 1/, 2/ or 2/6 because it isn't necessary for any complete set either. The 1925 proof 3d and 6d listed in Hern I don't consider as significant for the same reason. Probably the best contender for a regular issue Union coin is one of the 1926 proofs. However, I would rather have this 2/, subject to an inspection. As for your last paragraph, it depends upon which "best" coins you have in mind. I suspect that a decent number (more than most believe) either are in the hands of collectors who don't like TPG, aren't interested in selling and have no reason to grade their collections. The Mitchell Union collection to my knowledge is not graded and it's potentially the only one that could possibly rival Bakewell. Others are also likely still owned elsewhere, such as in the UK by those who either visited or left SA a long time ago. Previously, I estimated that the 1931 2D is the equivalent of a Judd R-7 with 4-12 in existence, the 1931 2/ a low to medium R-6 (13-30) and the 1931 2/6 a high R-6.but with 10 numerical and details coins, it is probably somewhat more common. I also previously estimated about 50 for the 1931 1/ but I now think that is far too low. With a mintage of about 4800, several hundred is more likely, though the vast majority are almost certainly VG or lower and many are details coins. The 1931 6D MS-63 has been in the census quite awhile but I haven't seen the MS-61 before. The AU details coin was sold by Heritage many years ago for $1265. I was the under bidder. 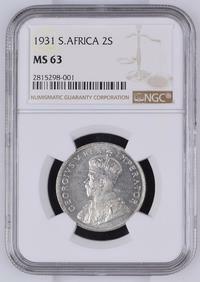 PCGS also has an MS-65 listed, but in this instance, there is a distinct possibility it is the same coin as the NGC ms-65. The Bakewell collection has one (MS-64 or MS-65) and another contributor here once acknowledged owning one of the other two. Scott Balson stated examining the mtichell 3D which he said was an UNC. I suspect this collection has a good chance of owning the full set in AU or MS. Lastly, there is also the 1931 set purportedly owned by someone in the UK. I was told it was inspected in person and also MS (like). What coin are you referring to here? I meant the 3D. I was typing in the dark and "fat fingered" the keyboard. Regarding the 1931 Silver Series in non-proof condition, I had a look at the Sangs population report but unfortunately it is nonsensical showing (for example) 8 non-proof Tickeys graded but only gives the grades of two coins. For Half Crowns, it shows zero coins graded but shows 4 coins in VF and another 4 as AU58. It simply does not make sense so for the time being should be ignored. I while ago I worked through 35 old price lists (issued between 1967 and 1998) to see how many 1931 Union silver coins were offered. This was in the pre-slabbing period for South African coins. I deducted all the coins that I thought was unsold re-offerings and also proof coins. I also check the BidorBuy offerings between 2012 and 2013 and the following non-proof coins (graded) were offered; Tickey (zero), Sixpence (3), Shillings (4), Florins (zero) and Half Crown (1). After that period (on BidorBuy), if my memory serves me right, a low grade Tickey (NGC graded G or VG) was sold by Randcoin and Brink Laubscher also had one on sale. A few 6d and 1/- pieces were offered and at least one Half Crown that I can remember (Sangs VF20). I cannot recall any Florins ever being offered in non-proof condition on BidorBuy. If one look at these statistics, I suspect that the 1931 Florin (2/-) is much rarer than many of us has thought before. Hern's Handbook catalogues it at R6000 in Fine condition, but if say a NGC graded F15 example should appear on the market, I would expect it to sell for more than 5 times that amount. Geejay offered one 1931 2/ on BoB sometime between 2009 and 2011. I was one of the under bidders. It was offered as a VF sold outside of a holder which he described as rejected by NGC for cleaning. This was prior to "details" grading. It was a toned coin which I thought looked pretty decent. It sold for about R11000. I don't know the 1931 3D price. I recall an NGC VG-8 offered for R70,000 (unsold), also between 2009 and 2011. The problem with buying one of these coins at this type of price is the general weak pricing for all other circulated Union, even prior to 2011. The 1931 3D, 2/ and 2/6 are much harder to buy than all others but paying such a strong price is a highly risk financial move and the buyer would have to want the coin really badly because the chances of finding a future buyer at an equivalent strong price I don't think are very high. The 1931 2/ is the coin in the Union series I would like to own most. But at the price it would likely take to buy it, it wouldn't be competitive with other coins I collect, some of which are about as scarce though not as prominent in the series. As for the Hern price, I have commented on it many times before. The latest edition I have is the 2010. In both my 2008 and 2010, the 1931 2/ is listed at a lower price than the 1925 and many other 2/ dates, all of which are a lot more common. It is one of several bizarre price listings. I spoke to the owner of this coin about two weeks ago. He wanted R1.2 million for the coin. Interesting. R1.2MM is somewhat over $90,000 USD. A bargain compared to many inferior US coins selling for the same or even a lot more but this implies a full set of 1931 circulation strikes in equivalent or near grade would be worth at least $300,000 USD and maybe as much as $500,000. 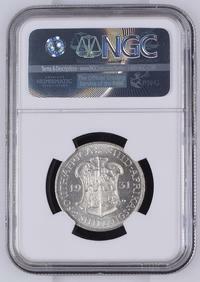 As one example, the Rudman 1732 Mexico pillar 4R NGC AU-58 trial strike sold for about $27,000 USD in 2016. I consider it an MS coin but it appears to have a slight chip (as struck) in the rim. There are less than 10 known (five I believe) with only the Norweb specimen supposedly better. It is one of the most prominent coins in the entire pillar series. In the past, I have mentioned a collector in your country who told me he knew a family in the UK who owned the full 1931 UNC set. It was in a case which I presume is similar to those issued for proof sets back in 1931, also my interpretation of the description in the 1950 Kaplan guide Pierre gave me. He asked me if I wanted to attempt to acquire it jointly with him but I wasn't interested. Later, he attempted to negotiate a transaction on his own but could not agree to terms. The set wasn't graded but the market was a lot stronger then (I believe in 2010) and the ask price I understood was less than $300,000 USD. If I owned this coin, I'd probably try to sell it through a prominent local dealer in a private treaty sale. It could also be offered through Heritage or a UK auction firm but a prospective bidder doesn't have any reference point to use, the closest example I can think of being the Bakewell 1925 2/ which didn't sell but the estimate I believe was 15,000 to 20,000 GBP. The 1931 is certainly worth a good bit more but I have no idea how much more. : .... also my interpretation of the description in the 1950 Kaplan guide Pierre gave me. He asked me if I wanted to attempt to acquire ..."
Sorry, correct. You gave me the 1950 Kaplan guide. Another collector informed me that they knew of this 1931 circulation strike set and had inspected it. I saw my octogenarian friend Pieter today - the owner of the 1931 2/- I have been talking about. He does not own a computer and the internet is as foreign to him as multiplication tables are to Zuma. Pieter lost his wife five weeks ago just before we left for Europe. I will post a picture of his 1931 2-Shilling as soon as he finds it. Pieter has no idea where the coin is stored in his house and will start a search for it soon. He owns one of of the (last?) truly great ungraded Union collections but keep losing track where he stores many of the coins in his house. His Victorian silver coin collection is actually better but that also has been mislaid somewhere in his house. His best collection is the German East Africa albums that he cannot find at the moment. I just checked the NGC News archives to see if any mention of this coin was included. I don't know when the coin was graded but couldn't find anything in the last few months. 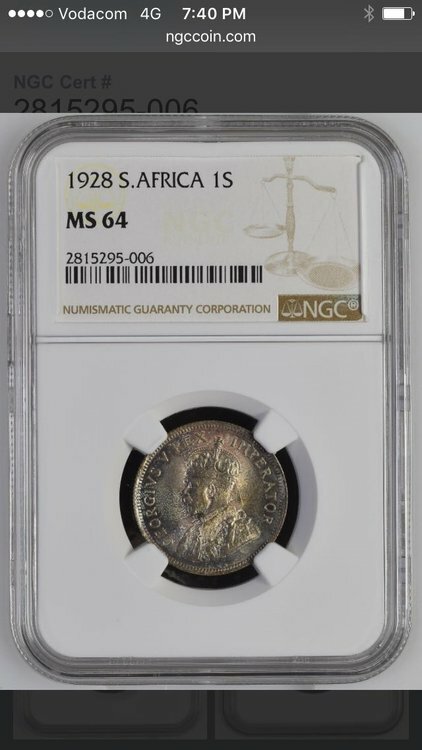 Considering that this is the last South Africa regular issue Union or ZAR coin to finally show up in the NGC census and that South Africa ranks second behind China among "world" coins, I would have thought that NGC would have recognized it given the assigned grade. This is a very good indication that collectors both in and out of South Africa have very little awareness of this coin. Even in South Africa, when I started posting on this forum, to my knowledge, I was the first one to highlight this coin and my recollection is that the consensus placed the proof version above it. In my Hern catalogs from 2006 and 2008, the proof is also valued a lot higher. I don't know if it still is now. Some more great coins that were graded at the same time. I agree. However, I have noticed that South Africa collectors don't seem to have a preference for toned coins. Both of these have the look of the Remick collection auctioned by Spinks in 2006. By the way, there is an also a 1931 NGC AU-55 half crown in the census I didn't see before. It must have been added in the last few weeks because the count is now 11 instead of 10, with "details" coins. Anyone seen this coin? 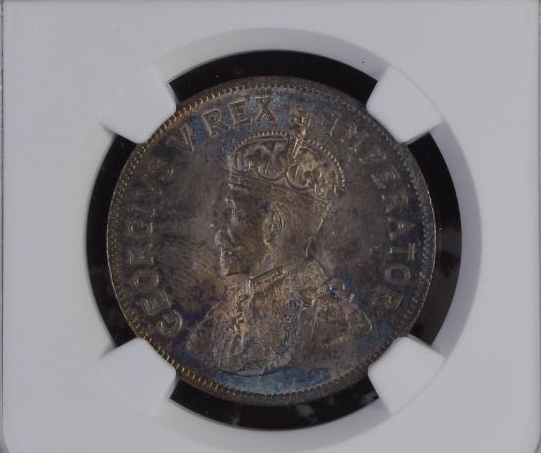 When I posted the NGC stats on the 30th of August (see post above), I stated that regarding the 1931 non-proof Half Crown, one coin was added to the pop report since my previous post about 3 or 4 years ago. It is currently being offered for R18 000 on BidorBuy by a well known coin company. As it is actually the second highest graded by the NGC, I don't think the price is excessive. Problem with these type of grades are that collectors just dont seem to care about them and arent willing to pay the respective price for a VG, F, VF and that matter even AU coins compared to their MS counterparts. Yes fine and well when their are a bunch of MS coins to buy from but when their are either none (example 1944 Shilling AU58 being finest - this coin should sell for R60k if you compare other prices if not more I mean its Finest with no MS ever graded - lets hear other opinions on this coins price? 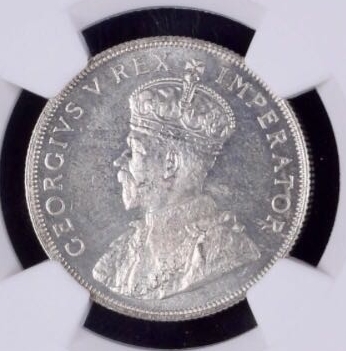 ), any of the 1926 coins in AU... when for instance there is only one MS coin for both the Florin (the MS65 is a bakewell coin that was slabbed as 2S but the actual coin inside the slab is a 1S) and Half Crown. A AU50 2S sells for just over R2000 and there is only 5 graded higher - 3 AU53, 2 AU58 and one MS64... and out of the 5 I know of one 1 AU58 and 2 AU55 being in collections leaving only 2 left which are probably in collections too and a MS64 florin 1926 what will that go for? 1926 is actually rare than the 1926 considering the stats. Same goes for the 1927 series... AU53 Half Crown sold for R4760 last month (There are only 2 x AU53 both in collections and 2 AU58 and then 4 MS (and those MS coins all sold for between R120 - R160k. Just doesnt make sense. 1928 1s AU58 sells for R2146 and a Finest Known MS has got a tag of R80k? And a 1931 1s MS61 got a tag of R90k. You offer a VG8 1s (nobody is even willing to pay R5000 or VG8 6p to Union collectors who have gaps in these dates/denominations and they just say nah im not interested. So this whole thing makes no sense. Then when a 1931 2S MS63's price tag is R1.2mil something just doesnt match up. Yea fair enough theres a huge difference between a MS63 and VG, F, VF and AU coin for that matter but the gap in price MAKES NO SENSE WHATSOEVER. In general. I cannot agree more with your sentiment. You are right on the spot. The difference between MS coins and lesser grades (regarding your examples) are just too large - it is as if many collectors are only going for the MS grades and a vacuum exists for takers of AU coins and lesser grades. However, I disagree with your take on the 1925 & 1926 Florins - although the NGC stats show them almost on par regarding the graded numbers and grades, I can assure you that the 1925 date is much, much more scarce in general terms. I sift through hundreds and sometimes thousands of Union silver coins a month, and finding a 1925 Florin is almost an impossible mission. The 1926 2/- date turns up now and then but obviously in better grades is a scarcity. The whole 1926 series are all fairly scarce but in lesser grades are not really rare. The 1925 Florin is truly a scarce coin in any grade. I must have stated similar sentiments here at least 100 times. The only reason for what you describe is predominantly a lack of real interest in collecting in your country. Disproportionate financial buying accounts for the prices of the (higher) MS. By this, I mean it isn't that the prices of the lower grades are usually too low, but those of the higher grades are too high. (Something I might, which I presume is exactly the opposite of what most here believe). The price structure and the price level must maintain "reasonable proportionality" (prices between grades) and the price level cannot be at price points which prices most collectors out of most of the coins they actually want to buy. A coin's price should generally (not always) be related to its numismatic merits given the prices of other comparable coins. One additional problem with Union coinage in circulated grades, especially low grades, is that the coins are almost always visually unappealing. In other words, the coins are ugly. Union coins is good to fine look much worse than most comparables I have seen in other series, such as pillars or US coins. With other series, I see decent low grade coins at least on occasion. With Union, I don't buy coins in these grades because better coins aren't usually that much more expensive but I don't recall seeing any. I don't consider it realistic to expect any collector to pay a "high" price for one of the scarcer Union dates such as the 1931 silver if the coin is unattractive for the condition. There are very few collectors from anywhere who will pay "high" prices just because a coin is scarce or rare and only a financial buyer will do so for a coin they don't like. At least with US coins, there is an active market for the more widely collected series, so the buyers have a much better idea of how much a coin should sell for. With these coins, the market is so thin, sellers consistently attempt to overcharge buyers and the prices fluctuate so wildly from one sale to the next. The price history more closely resembles penny stock trading or a casino. Most collectors are interested in buying coins at relatively predictable prices, not getting ripped off or being take to the proverbial cleaners. The price guides used to provide this predictability. Since the widespread use of the internet, these references are worthless.